By now most people have heard of Alice in Wonderland. You know the girl that fell down the rabbit hole and ended up in that weird and crazy place where the Queen of Hearts was chasing her and there was a talking cat and a crazy tea party and a hookah smoking caterpillar. Yes I know that all sounded quite nuts but hey, it’s a story in a nutshell. 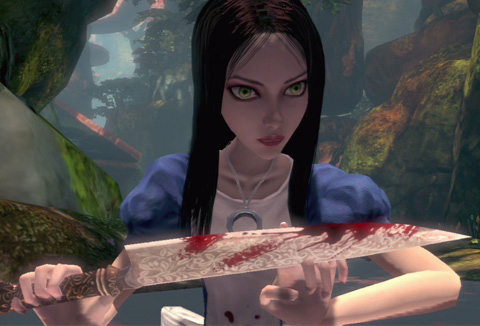 Well Alice is back in Alice Madness returns, the sequel to the 2000 PC title American McGee’s Alice. Now 11 years after the first game, Alice is out of the nuthouse and back to living in London trying to deal with the fiery death of her parents. Unfortunately she’s not doing too well and poor Alice, who is really cracking up, ends up back In Wonderland. Wonderland though, like Alice, is a much darker and sinister place now and it’s going to be up to our heroine to save Wonderland again, but this time she has to save Wonderland to save herself from her own growing insanity. If you missed out on the original game don’t worry, all new copies of Alice Madness Returns will include a onetime use code to download the original game. If you buy a used copy you can still get the original buy purchasing it from the in game main menu on Xbox Live or Playstation Network. I’m excited about this game, American McGee’s studio Spicy Horse created the original and are the ones responsible for the Madness Returns sequel. If you like crazy, horror, dark 3rd person platforming adventure games you will definitely want to check this title out.